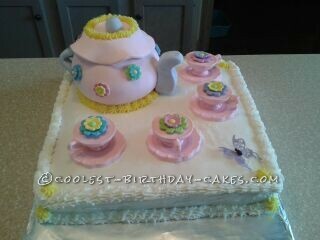 My granddaughter Madison wanted a Tea Party cake for her 8th birthday. I’ve used this site many times over the years for inspiration and helpful tips. When I searched for teaparty cakes, the teacups seemed to be the most challenging to recreate. I wanted to share this picture because at the last minute I checked with a local cake shop that carries numerous candy molds and found a mold for a teacup, saucer and spoon in one mold. I used white chocolate melts and tinted them pink to match the teapot. She was very pleased with how the cake turned out! Thanks to everyone that submits pictures and helpful information.